SmartSound offers videographers and game developers a vast library of royalty-free music. Together with our quick music search function, the difficult task of finding just the right track for a scene becomes simple and painless. 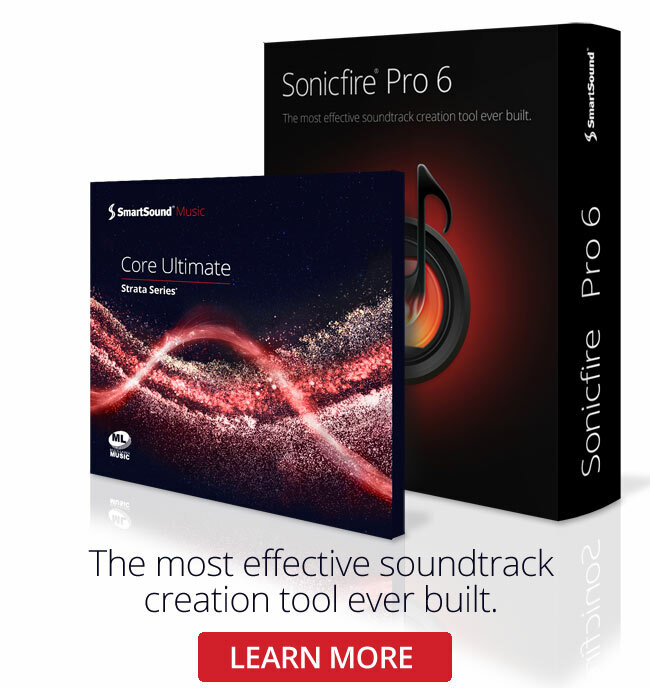 Better yet, SmartSound offers award-winning technology in its SonicFire Pro utility; a more granular search engine meshes seamlessly with Mood Mapping, Timing Control, and Custom Length functions. These allow producers to infinitely customize every track’s instrument mix, and perfectly tailor the track to the scene’s length and rhythm. Videographers know that those tasks are often painfully slow, but with SmartSound, they get done with a few clicks of the mouse, saving time and improving the end result. It’s easy, now, to nail the tracks to draw your audience into just the right emotional response to your pivotal scenes.